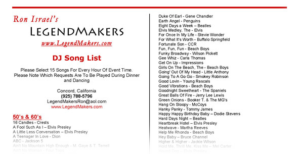 At Legend Makers, we have assembled the largest and most popular list of songs for every occasion. Click the image below and browse the thousands of examples. If you don’t see what you are looking for here, just ask and we’ll to have available for your event.